The little town of East Montpelier, Vermont goes out of its way to seem quaint, when one looks it up on the internet. In our small Vermont racing community, it has been best known as the headquarters of ageless Joey LaQuerre, Sr. and his racing progeny, all stemming from the family patriarch, Armand LaQuerre. In fact, there was once even a short – lived race track in the town, right about where the trailer park sits now. The fact that a very nearby road is called “Fair Road” might have something to do with the existence of a track there at one time. who is shown below with racing legend Norm Chaloux. At any rate, the place is rapidly becoming known as the place where Emily Packard hails from. Just like her neighbors, the LaQuerres, Emily comes from a racing family, starting with grandfather Ellery Packard, who likely raced upon that old East Montpelier track around 1950. The teen age Vermont girl, if seen out of her element and not in her driving suit, would not stand out from any other girl in this era and in that part of the world. In the suit, and in her late model sportsman, it is very easy to tell her apart. 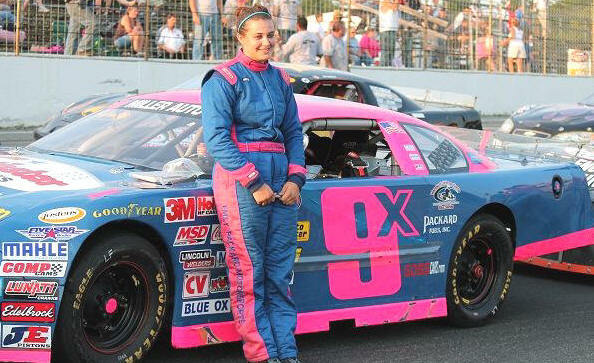 Obviously, the support, guidance, and encouragement of the Packard family, as well as the team’s crew chief, the veteran Frankie Woodard, are what have placed Emily in her blue and pink ACT late model car. However, looking back through the racing years, there has been a small number of female competitors whose own experiences and hardships have helped pave the way to the starting grid for Emily. The soft - spoken , very feminine Vermont teenager is about as stark a contrast to NASCAR pioneer Louise Smith as you could ask for. South in the 1950's. She probably could have rassled half of them to the ground. Both Louise and Ethel Flock Mobley were very early female drivers in the rough and tumble beginnings of NASCAR racing in the South. The two would contend with a legion of opinionated, rough – hewn, tobacco – spitting good ol’ boys who were not crazy about having women or African Americans anywhere near the sport. 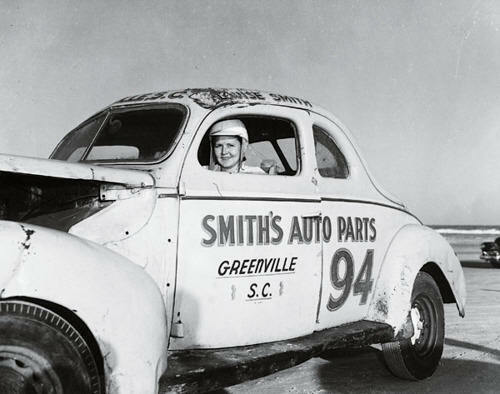 The stocky Smith, sometimes referred to as the First Lady of Stock Car Racing, has one particular photo in which she is posing calmly in front of a throng of male bystanders with absolutely flattened Ford coupe. Flock, sister to the legendary three Flock brothers, may or may not have had a little easier time in the sport, in deference to her siblings. Emily definitely doesn’t look much like the ‘50’s driving ladies, but she has the same determination and courage as Smith displayed. 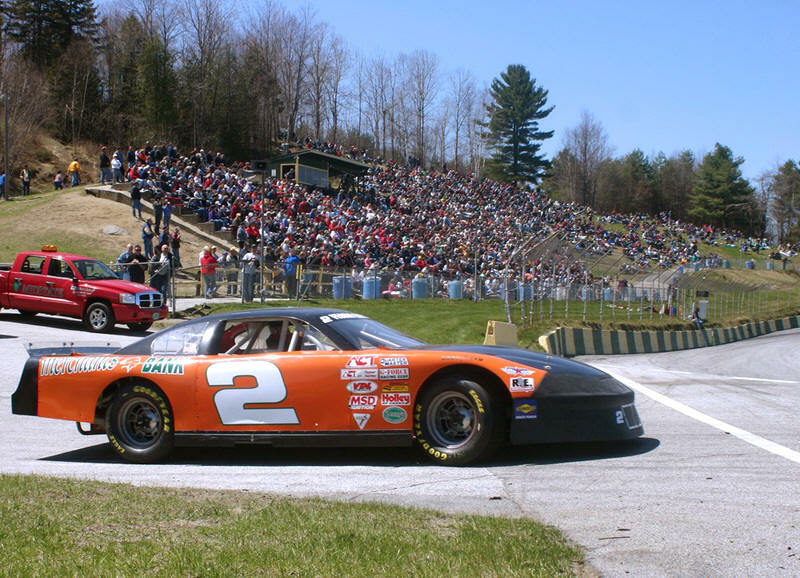 During the 2012 season, she did double duty running the hectic Thunder Road [four cylinder] street stock division while running a late model sportsman at other tracks – sometimes against the top ACT teams. When the bullish Gary Bashaw dumped her, end over end, she was right back on the track the following week; you can bet Bashaw wasn’t. 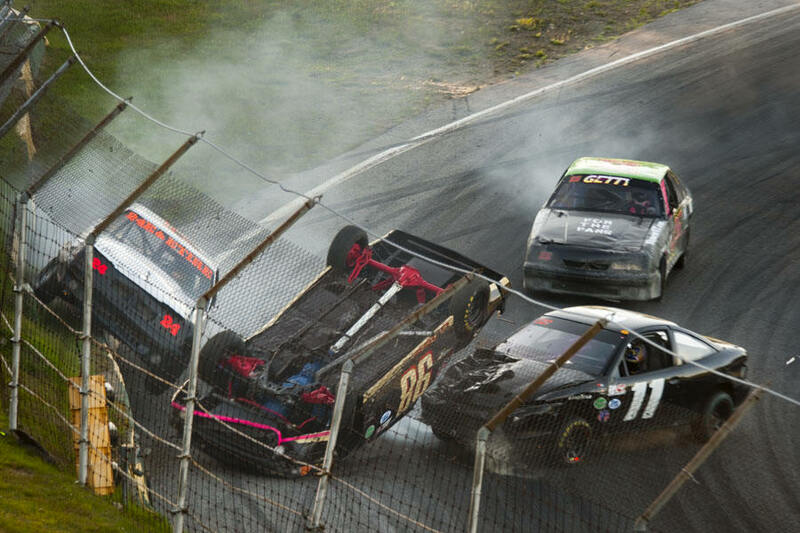 Even this hair – raising wreck in the Thunder Road street stocks did little to throw Packard off her stride. She was right back the next week. Below – Tracie Bellerose pulls out onto the Thunder Road racing surface. The obvious immediate names that come up right before Emily’s emergence would be those of nationally – prominent Danica Patrick and Jessica Zemkin, a Tony Stewart protégé, who is very well known in open wheel and Northeast racing circles. However, in Packard’s “back yard” , the predecessor of note would be New Hampshire’s Tracie Bellerose. Had her career not been slowed by a serious arm injury, it is hard to say how far Bellerose would have risen by 2013. A recent comeback at Thunder Road was cut short by financial shortcomings, but she could still twist a wheel with the best of them. No doubt, Emily Packard was taking note. Getting back into the ‘70’s and ‘80’s, the national race fan would bring to mind names like Janet Guthrie, Patty Moise, and Shawna Robinson as forerunners to Packard. Guthrie, who looked more like an economics professor from a nearby college, did run in the Grand Nationals and in USAC. She performed quite well and attracted a lucrative sponsorship from Kelly Girl. Robinson, who was known for racing tractor trailer trucks, did run in some NASCAR events ,as well. Patty Moise, who married one of her Busch Series competitors, ran in what today is the Nationwide Series, primarily. 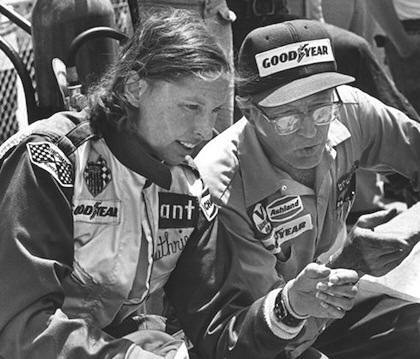 Janet Guthrie and her crew chief examine her car, when she was running in the NASCAR Grand National division. 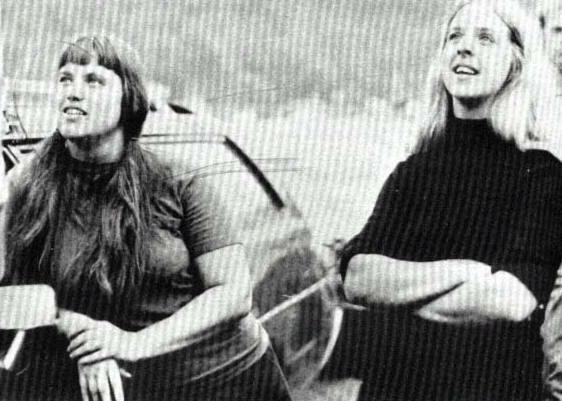 Again, in Emily’s immediate realm – Thunder Road [and, in those days, Catamount Stadium] there were three pioneering gals who broke the ice for Packard. The first [and least known] was a Monkton, VT girl named Bev Stearns. She tried her hand at running in the early Hurricane Division [big automatic transmission support class cars]; but she didn’t run for long. The best known of the three was from the same general area as Stearns – Barbara Jean “BJ” Willard. Bev Stearns looks over Ed LaFountaine's Hurricane division car at Catamount Stadium in 1971 prior to actually giving it a try [below] in car 73. Willard started off with a full – sized Mopar in the Hurricanes, running her trademark brown #33. Willard never won a feature, but she drove very well and was a driver who had to be contended with every week; she was not a novelty or field filler. When the Hurricanes dissolved into the six cylinder Grand American pony cars, Willard drove both a Dart and a Mustang before deciding to stop racing in the 1980’s. She had her share of non – feature wins. Less familiar but arguably the best of the three Vermont forerunners was Linda Alexander, who now lives in the Midwest. Alexander started out less successful than Willard and – like BJ – ran with the close cooperation of her husband. Starting out with a Hurricane class 1957 Chevy, Linda and Alex were soon settling down to Fords and building some real head – turning cars. While Alex concentrated on the bucolic Bear Ridge Speedway near their home, Linda drove a number of different Alexander #05 cars on dirt, on pavement, and tracks of all sizes and configurations. less known at Catamount but went on to a much fuller career than B.J. Between the Alexander Mustang, the Granada, and whatever else Alex put her in, Linda raced competitively at Catamount, Thunder Road, Bear Ridge, Can Am Speedway, and probably more locations. When they moved west further, she continued by running a high – powered Camaro at Imperial Fairgrounds. Linda ultimately had more flags than the better – known Willard; and both would be excellent models for Emily to follow had she been old enough to have any idea who they were. Emily has one consideration that none of her local forerunners had to contend with – high pressure expectations. 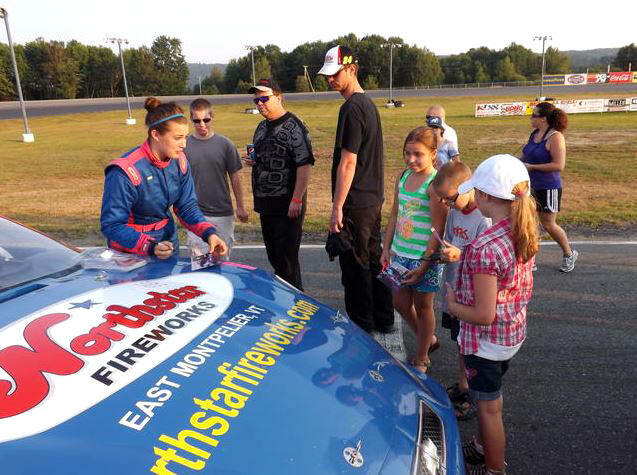 She has those expectations and she has landed herself squarely, at an age younger than any before her, in the ranks of the most competitive and difficult racing in the Northeast – late model sportsman. Emily races against drivers ranging from not much older than she to as old as in their ‘60’s. The tight rules and the built – in parity and uniformity of this racing make it even harder to compete and get ahead. Emily maneuvers the tricky Thunder Road quarter mile with veteran Marcel Gravel in the 5 alongside. Then, too, the fact that she has run weekly shows at the high – banked and hellaciously difficult Thunder Road, has made the task even tougher. The Barre oval has turned more than one otherwise top driver into a nervous also - ran. Not every one can run there, and the weekly Thursday night shows produce some of the best racing you are going to see anywhere in the country. As the 2014 season unfolds [if it ever stops having ice storms and sub zero temps] the 9VT team will be at it again. Emily has already distinguished herself in several races in 2012 and 2013. 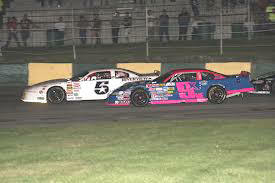 The two long distance races that stick in my mind were both at Devil’s Bowl. In ’12, she was running second with only two laps to go when knocked off the track by Brian Hoar, in one of his very rare miscues for which he felt terribly. The following year, in the same race, she was second again only to be knocked out in the final few laps by mechanical failure. Emily takes time to give some young girl admirers some attention and an autograph. Maybe one of them is the next Emily on the track. Just to look at females who raced within the borders of Vermont in recent decades is taking a narrow view; but, one cannot cover them all. Sallie Graves, a Maine late model sportsman driver, deserves inclusion in those pioneering the way for Emily. A winner of ten features at the challenging Oxford Plains Speedway, she won her first there on July 14, 1979 – becoming the first women to win a weekly race series feature there. Like Bellerose and Packard, she was simply in there running with the best the boys had to offer. Like another female racing trailblazer, Lori Cary Langevin [who began her career at Devil’s Bowl], Emily Packard seems unfazed by racing that fast and with a field filled with males. If she needs an occasional shot of encouragement, she can depend on the family, Frankie, and her growing legion of fans. But, when she needs a special boost, she might want to look up what there is on the Willards, Belleroses, Alexanders, Langevins, and all the other female chauffeurs who came before her; they are quite a story to behold.